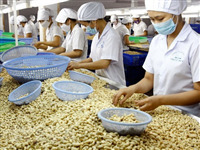 Vietnam earned more than 3.7 billion USD from exports to Thailand as of August 2018, up 21 percent year on year, higher than the country’s average of 16.7 percent, according to the General Statistics Office. Of the figure, mobile phones and spare parts brought home the most with 996 million USD. Other goods earning 100 million USD and above included crude oil, electronics and accessories, and transportation vehicles. During the period, Vietnam spent over 7.5 billion USD on imports from Thailand, up 14.3 percent year-on-year, resulting in a deficit of over 3.8 billion USD. In the first eight months of this year, Vietnam’s total import and export turnover hit 308.07 billion USD, up 13 percent over the same period of 2017. Of which, export turnover was 155.4 billion USD, up 14.5 percent, and import was 152.7 billion USD, a rise of 11.6 percent./.